Shenyang Chuangwei Translation & Consultation Co. Ltd. is a professional translation and consultation company found by a team of domestic and foreign experts who are engaged in professional translation for many years. They have profound scientific attainments and rich translation experiences and returned students and scholars studying abroad. The company mainly engages in the interpretation and translation service of various languages such as English, Japanese, Russian, French, German, Korean, Spanish, Italian, etc. and offers professional, authoritative, fast, safe and excellent translation service to government departments, social organizations, enterprises, public institutions and individuals. Shenyang Chuangwei Translation & Consultation Co.Ltd., cooperated with many national colleges, universities and scientific research institutions of foreign languages, and a fully reinforced team with consummate translation level and high quality is formed. The company is provided with nearly one thousand full-time and part-time translators; in our team, most personnel are professors of translation, associate professors, advanced scholars, returned students, scholars studying abroad and professional translators from major scientific research institutions and organs with rich translation experiences. Some of the translators are translation experts enjoying some reputation in national translation fields. 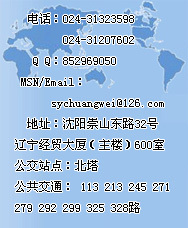 Shenyang Chuangwei Translation & Consultation Co.Ltd. is driven by clients’ demand and strives to improve service quality. The company regards the promotion of the exchange of Chinese-foreign cultivation, economy and technology as its own responsibilities. The company has direct or indirect services for almost one hundred companies all over the world, including Liaoning Provincial Bureau of Science and Technology, Liaoning Provincial Administration of Foreign Experts Affairs, Institute of Metal Research Chinese Academic of Sciences, Anshan Iron and Steel Group, Shenyang International Economy and Technology Foreign Cooperation Co. Ltd., NEU Industry Group, Shenyang City Construction Group, Shenyang Machine Tool Group, Shenyang Yuanda Group, Yingkou Xiaoyu Group, Institute of Strength and Physics Siberian Branch of Russian Academy of Sciences, etc. Shenyang Chuangwei Translation & Consultation Co.Ltd., also works for large-scale social activities hold in Shenyang such as Northeast Asia World Economy Expo hold, World Horticulture Exposition, World Cultural and Natural Heritage Expo. etc. Shenyang Chuangwei Translation & Consultation Co.Ltd., has established a series of strict operational management and quality control system and scientific and canonical operation workflow, controls the quality by strict examination standards and offers fast and excellent translation service to government departments, foreign institutions in China, foreign-related large, middle and small enterprises and individuals. Our tenet is: we are available for the world and create first-class service. Shenyang International Economy and Technology Foreign Cooperation Co. Ltd.
Shenyang Wanming Special Machine Co. Ltd.
Shenyang Jixiang Food Machinery Co. Ltd.
Shenyang Yude Electronic Instrument Co. Ltd.
Shenyang Jinfeng Special Cutting Tool Co. Ltd.
Hongkong Zhongwei International Group Co. Ltd.